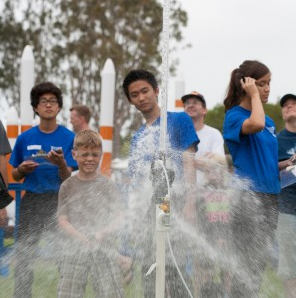 Discovery Cube Orange County and Boeing are once again teaming up to host the 22nd annual Rocket Launch on Saturday, May 9th at the Boeing Huntington Beach facility. This free, family-friendly event will have young engineers design and build their own bottle rockets to participate in the annual competition, meet a real NASA astronaut, and have the opportunity to win the grand prize of viewing an actual rocket launch. The event will be held from 9am to 2pm on May 9th at the Boeing facility, 5301 Bolsa Ave., Huntington Beach. Attendees will be able to design, build and launch their own rockets created from two-liter plastic soda bottles. Volunteers at an ‘Ask an Engineer’ table will be available for professional guidance to rocket creators. The hand-made rockets get launched into the sky by using a blend of pressurized air and water for propulsion, and then deploy a parachute as they fall back to Earth. The rocket with the longest “hang time” wins the competition.